This extremely popular facial technique uses a three-pronged attack to address a variety of patient concerns. Last year alone, more people opted for this patented procedure than for botox treatments. 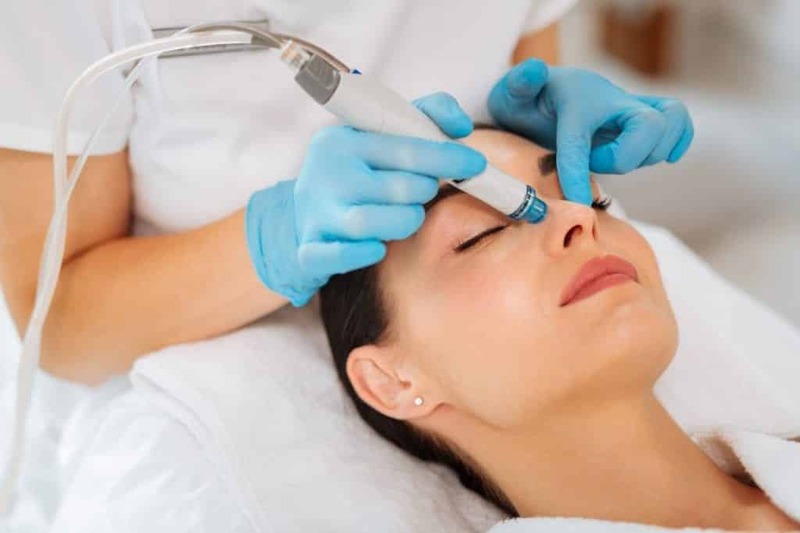 With a hydradermabrasion device, your doctor can scrub your skin, extract impurities from pores, and use customized fillers and serums to address the particular issues you want to address. It’s an aggressive treatment that doesn’t feel aggressive — the selling point for the patient is that it’s quick, painless, and effective on multiple levels. And it’s consistent: Since the tool uses the same process each time, you’ll get the same results. Rather than employ a typical scrubbing technique, Hydrafacial uses a patented handpiece with something known as “vortex technique.” The tool acts like a cooling scrub brush and a pore vacuum at the same time, cleaning your skin, exfoliating it, and extracting oils and impurities. The first step involves a deplaning technique that strips the outer layer of your skin to open up the pores — makeup, dirt, and oil get pulled away. There’s a peeling step, with salicylic acid, that doesn’t burn the same way that traditional peels do. Then comes the extraction, which for some people might be the most interesting: The HydraFacial tool actually will show you some of the impurities that get pulled out. Depending on your level of interest, this could be a satisfying experience, as you’ll really get a quantitative result. This process is followed by an application of a serum that hydrates your skin cells, plumping and brightening them. And depending on your skin’s needs, you and your dermatologist can develop a formula tailored to you. These added boosters can plump up sagging skin, fill in deep lines or wrinkles, attack discolorations and spotting, add collagen, or utilize a variety of different peels. It’s also easily worked into other techniques, like botox or Fraxel, facial fillings, or laser treatments. The Brightalive Booster Serum combines peptides, glucosamine, and glycerin to simultaneously block pigmentation and give skin a fresh, hydrated glow. The Growth Factor Boost uses proteins that help keep skin hydrated and firm. The Dermabuilder Boost uses peptides to even out skin tone. The Britenol Boost combines vitamin C and bearberry extract to brighten dark spots and help repair sun-damaged skin. It’s an easy, in-office technique that only takes about 30 minutes. And the point is for it to be painless, almost like a cooling brush over your face. You won’t be wincing after the procedure. Most patients report no side effects whatsoever after a HydraFacial treatment, and others go days without even applying any makeup after the procedure. How frequently should you get one? After an initial visit, it’s probably a good practice to go every few months, depending on your needs and your dermatologist’s recommendations. Some people enjoy monthly Hydrafacials. One of the benefits is that the technique itself is consistent, and is not incredibly dependent on the technician applying it. Because the tool is doing the same work each time, you should be able to rely on the same results each visit. What does your skin look like afterward? A normal facial can leave your face looking red and inflamed, with at least an hour of soreness or burning. After a HydraFacial treatment, your skin should feel lighter and look brighter. There’s a radiant effect, which has led many people to go for the treatment before big events, like weddings or public appearances.